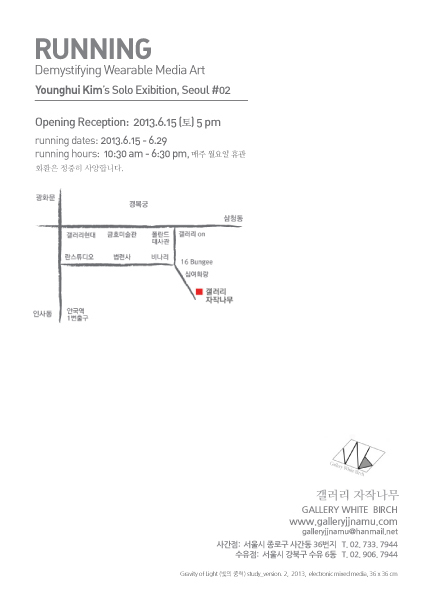 Younghui Kim is having a group exhibition with 4 other artists(Romy Achituv, Dan Mikesell, Dongsoo Suh, Jaemin Lee) who are also her colleagues at the WCU Digital Media Public Art Research Lab. 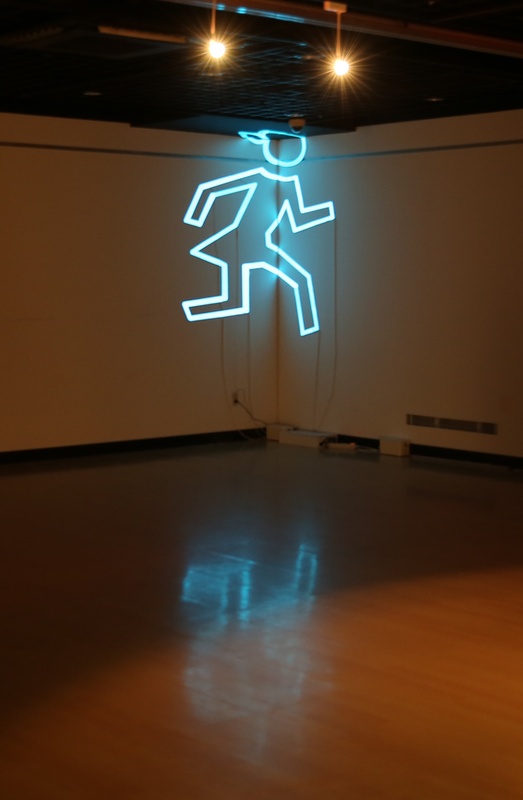 A Characterized figure that looks like a common running icon on the exit and entrance signs in cities are drawn using thin EL (Electroluminescent) sheets. This electronic drawing is installed where two sides of walls and a celling meet. 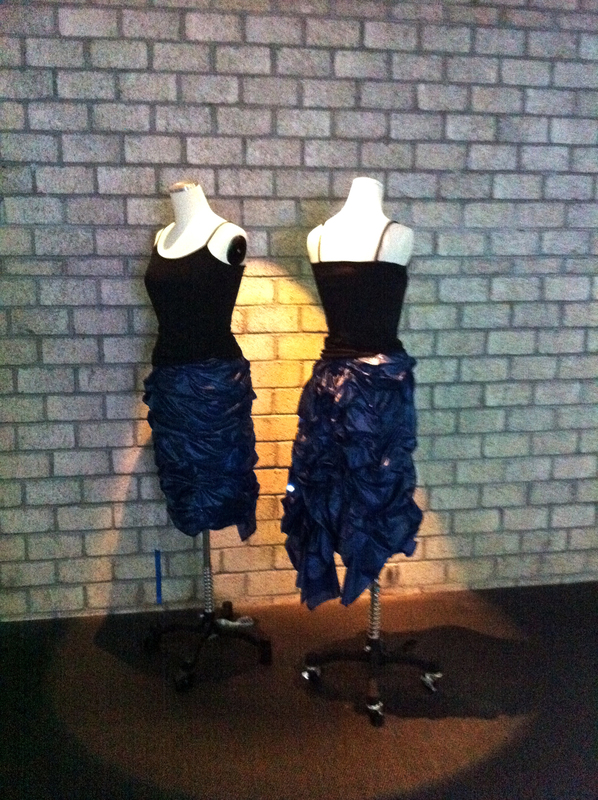 Depending on the location of the visitor, it will look distorted or right. 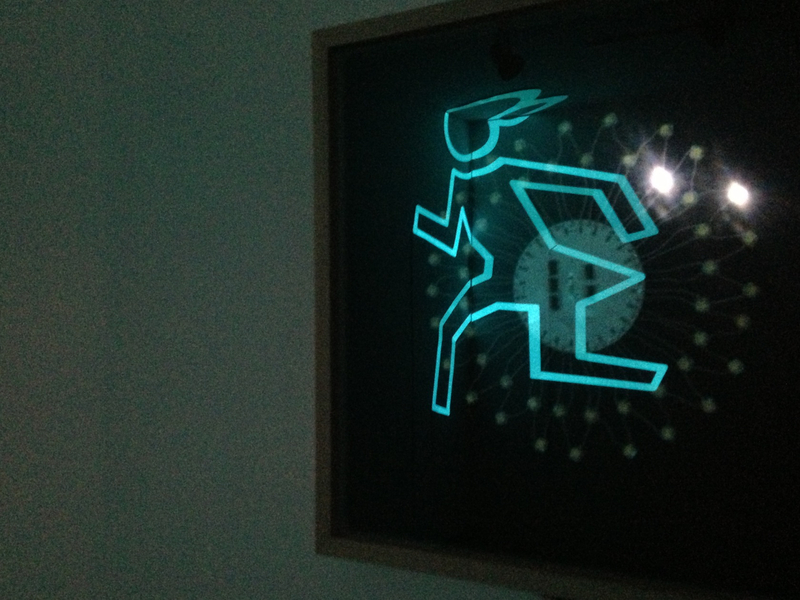 When it is dark, the running girl icon is reflected all around, running toward all directions. How long does a moment appear to you? 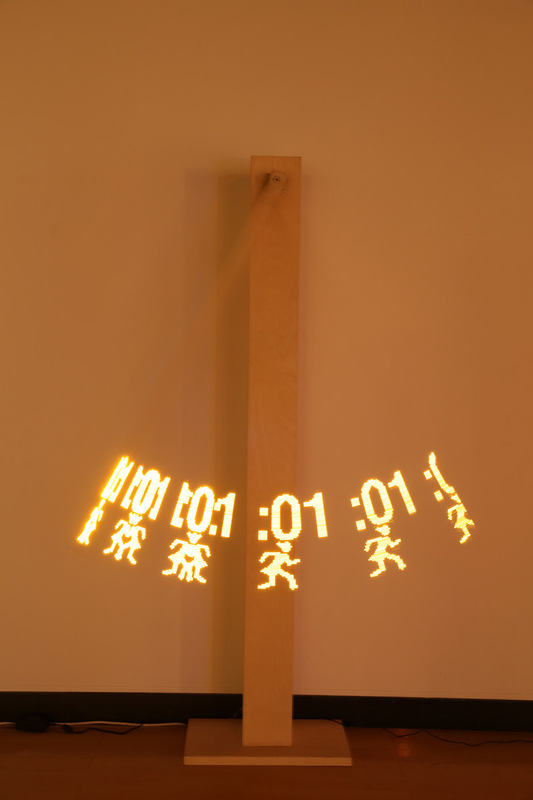 ‘A Moment’ is a kinetic display using a POV(Persistence of Vision) display and it swings like a pendulum while displaying an ephemeral message. We are “RUNNING” computer software. 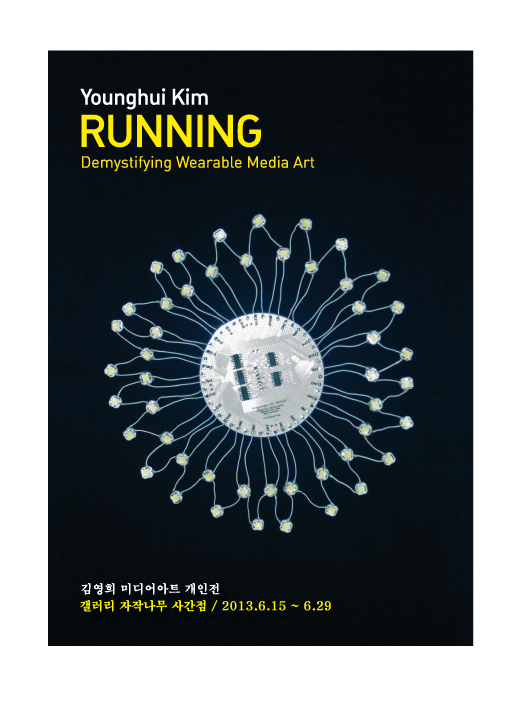 We are “RUNNING” media art or “RUNNING” wearable performances. We are not physically running sometimes but, we are running a lot. Actually, we run everyday. Are we looking for an exit? or Entrance? Are we running for the new beginning? the new end? There are more times when we are not sure why we are running but, we can see ourselves runnings reflected in every corners of the city. 실제 몸으로 달리지는 않지만 우리는 많은 것을 “RUNNING” 하고있다. 이렇게 우리는 매일 달린다. 출구를 찾아서? 입구를 찾아서? 새로운 시작과 끝을 향해? 우리는 무엇을 향해 그렇게 달리고 있는지 알 수없는 경우가 더 많지만 우리가 달리는 모습이 도시 이곳 저곳에서 반영되고 있는 것을 쉽게 찾아볼 수 있다. Younghui Kim (김영희)는 뉴욕에서 90년대 중반에 인터랙티브미디어영상작업을 시작하였으며, 지난 10년간 웨어러블을 미디어플랫폼으로 작품활동을 해왔다. 그의 작품들은 예술과 기술이 혼합되어 여러 형태로 우리에게 다가온다. 그러하기에 그의 미디어아트 창작물은 여행처럼 긴 작업과정을 거쳐 완성된다. 먼 여정의 도착지를 가기 위해서 여러 개의 작은 마을을 거치듯이 작가가 하나의 작품을 완성하기까지 여러 버전의 과정을 거친다. 본 전시에서 작가는 대중이 쉽게 알 수없는 미디어작품의 창작과정을 해체하여 하나 하나씩 작품으로 선보인다. 웨어러블 미디어 아트작품들은 영상으로 스크린에 프로젝션된다. gravity… It started with this simple idea of light having gravity like water. 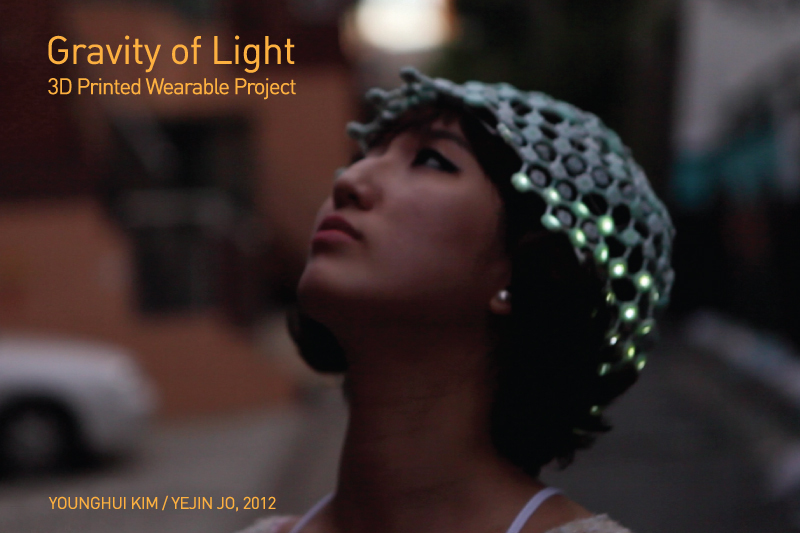 “Gravity of Light” is a wearable technology art made of 3D printed smart textile that displays the wearer’s natural movement of head such as tilting. With embedded custom designed electronic circuitry in a hat, light pixels move on the surface of the hat flowing toward titled direction. She showcased one original (still in a good condition after five years) piece along with new edition created with a different technique and parts. 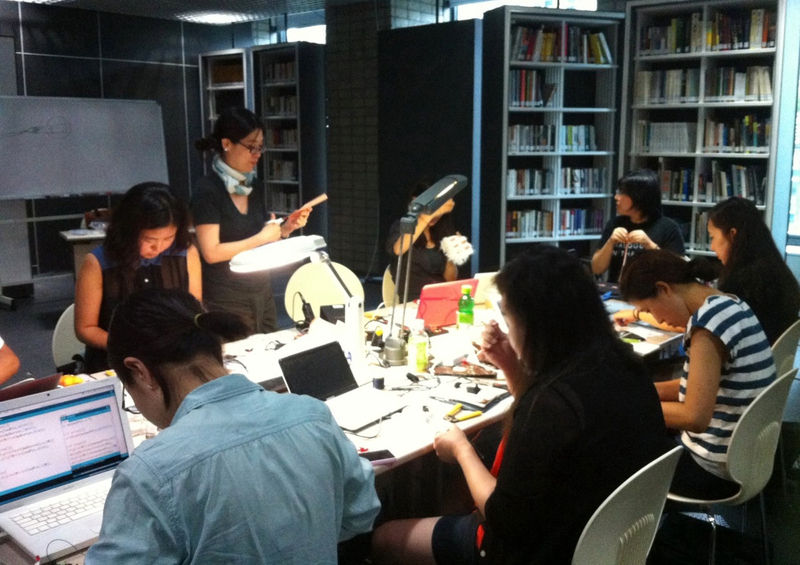 Along with one-month long exhibition, she taught a special two day workshop on Wearable Technology for public applicants. 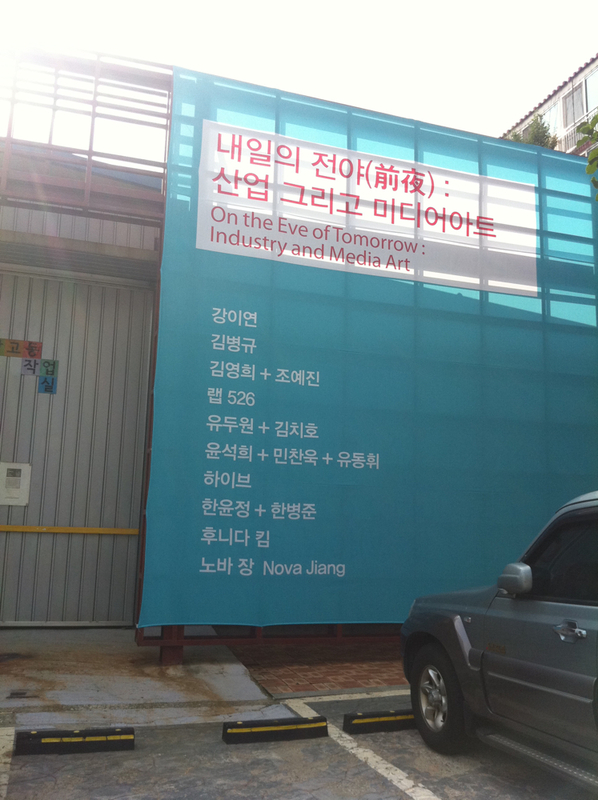 It was held at Art Center Nabi gallery – Aug 22, 23rd. 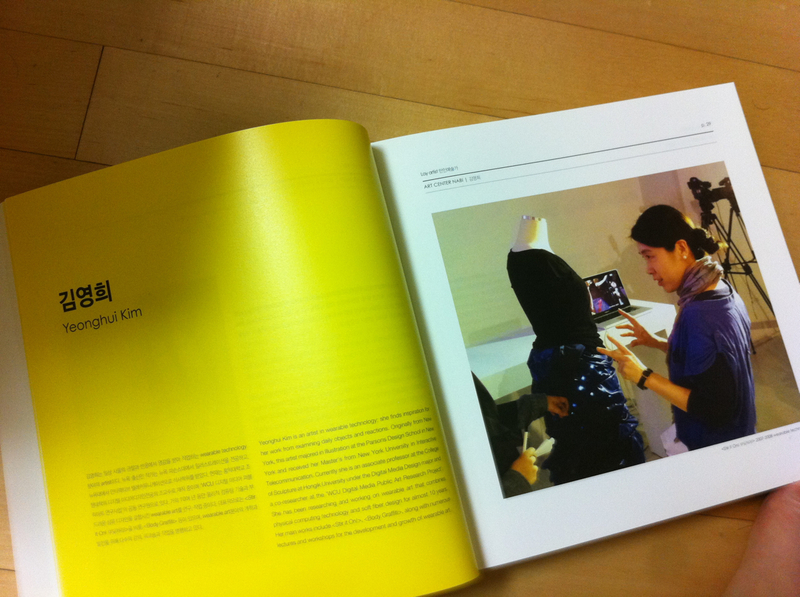 Her interview titled as “Wearable Computing as Art” is included in their in depth catalog. There was an article about Body Graffiti Project in The Creators Project in both Korea and UK, (both Languages) I was busy preparing DALSMA 2011 presentation so now, I get to post about it here.